Police Chief Eliot Isaac declined to say whether police have identified possible suspects in the Sunday gun violence inside the Cameo club, a popular hip-hop music spot. CINCINNATI: As Cincinnati police delved further into their investigation of a nightclub shooting melee that left one person dead and 16 injured, city officials Monday urged more witnesses to come forward and offered reassurances amid questions about safety in public gathering spots. 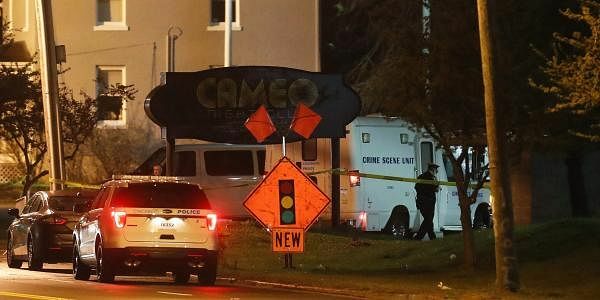 Police Chief Eliot Isaac declined to say whether police have identified possible suspects in the Sunday gun violence inside the Cameo club, a popular hip-hop music spot near the Ohio river east of downtown Cincinnati. But Isaac said police weren't actively looking for anyone as yet. "We're gathering information ... we're making some progress," Isaac said after giving city council members an update on the investigation. Investigators believe multiple shooters were involved; police estimate more than 20 shots were fired, sending club patrons diving to the floor or scrambling away from a chaotic and terrifying scene. The FBI and federal firearms agents are assisting Cincinnati police. Isaac said a number of people have contacted police with information, including a person who came forward Sunday evening to report having been shot, raising the total number injured to 16 besides the 27-year-old man who was slain. Two of the 16 injured were in critical condition Monday. Three other people remained hospitalized in stable condition. The initial investigation indicated a dispute in the bar escalated into a gun fight around 1:30 a.m., the chief said. No club security footage of the shooting has emerged, he said. Isaac said some of the wounded could be key witnesses, and city officials urged any reluctant potential witnesses to help, saying they would be protected. Crime witnesses afraid to testify for fear of retribution have been a problem in some past Cincinnati cases. Isaac said the nightclub had metal detectors, or wands, but wasn't required to by law. Four police officers were working off-duty security details in the club parking lot, but he emphasized the club provides its own security inside. He said Cameo club operator Julian "Jay" Rodgers has been cooperating with investigators. The veteran Cincinnati area entertainment operator pledged to "do everything in our power to make sure the monsters that did this are caught and brought to justice." Rodgers also said the club will remain closed until police and internal investigations are completed. The city solicitor told council members the annual review of liquor licenses is coming up next month, and establishments with a history of violence or being a neighborhood nuisance could find their licenses challenged. Authorities said bar owners often work with police to make safety improvements. City officials say the Cameo club has been the scene of past violence, including a shooting inside the club on New Year's Day in 2015 and one in the parking lot in September of that year. State liquor agents who inspected the club Sunday after the shooting found marijuana along with partially smoked marijuana cigarettes in an employee-only section and cited the club with drug abuse and drug possession, said Adam Johnson of the Ohio Investigative Unit. Several city leaders pledged to find ways to prevent such violence, while acknowledging such outbreaks continue to occur in public venues across the country. Mayor John Cranley said the city has gotten outpouring of support from elected officials, including fellow mayors in other cities. "I think they know that this could happen anywhere," Cranley said. Shootings at U.S. bars and nightclubs have rarely involved more than a handful people. But the Orlando, Florida, nightclub massacre last June that killed 49 people and injured 53 was the exception, making it the worst mass shooting in modern U.S. history. One teen died and eight others were injured in 2010 when gunfire broke out in the parking lot of a St. Louis club after a group was turned away from entering. Two teen girls died and seven other people were hurt in a 2009 shooting outside an underage nightclub in Portland, Oregon. In Cincinnati, four candles illuminated a makeshift memorial outside the club on a foggy Monday morning. A poster dedicated to O'Bryan Spikes, the man killed, said "R.I.P. Lucky" and "Father Son Uncle Brother."